DID YOU LOOSE A LOVED ONE IN AN ACCIDENT OR DUE TO THE NEGLIGENCE OF SOMEONE ELSE? The NYC wrongful death attorneys at Gair, Gair, Conason, Rubinowitz, Bloom, Hershenhorn, Steigman & Mackauf specializes in dealing with families that have experienced such tragedy and have developed a unique ability to help those affected by the death. Last year our attorneys obtained a $41.5 million verdict for the wrongful death of a man who was struck by a truck. This was the highest wrongful death verdict listed in New York State in 2017. The death of a loved one is a profound and horrible event. We realize how important it is to provide our clients assistance with basic legal issues that arise after a death and how important it is that the wrongful death action be tenaciously prosecuted so that a full financial recovery can be obtained. The law in a wrongful death case in New York is multifaceted and our attorneys have both the experience and expertise to build a solid case against all negligent parties. Wrongful death actions in New York are governed by The New York Estates, Powers and Trust Laws(EPTL). EPTL, Section 5-4.1 entitled "Action by personal representative for wrongful act, neglect or default causing death of decedent," gives the right to the legal representative of the estate to bring an action for wrongful death. The right to recover damages for wrongful death is governed by EPTL, Section 5-4.3 entitled "Amount of recovery." The statute is what is known as a pecuniary loss statute. This means that the legal representative of the decedent must prove pecuniary loss which includes loss of support for the decedent's next of kin as a result of the loss of the decedent's earnings. In the case of the death of a parent who leaves surviving a spouse and dependent children a claim may be made for the economic loss suffered by them. Economic loss is not limited to loss of earnings alone. Loss of services to the decedent's spouse as well as loss of parental care and guidance to the decedent's children may be claimed. In the case of the death of a child loss of services to the parents may be claimed. Since the statute is a pecuniary loss statute it is imperative that the attorney fully understand the restrictive nature of the Statute and meticulously prepare the case in order to fully set forth all economic loss so as to obtain the highest possible recovery. We therefore retain expert economists and financial analysts because every wrongful death case has its own set of associated losses, including lost wages, the cost of care, and many other monetary costs as well as pain and suffering. In order to accurately assess what these costs will be in the future, we use these financial professionals in order to derive the best possible resolution for our clients. If you lost a loved one as a result of an accident, medical malpractice or defective product, please Contact our firm to discuss your case. The fire at Stouffer's Hotel in Westchester County. We represented the estates of 11 members of the Board of Directors of a Fortune 500 Company killed in the fire in this wrongful death case. The case settled for more than $50,000,000 . $41,500,000 verdict for the family of a 43-year-old City sanitation worker who was fatally hit by a street sweeper. The worker suffer 2 to 3 minutes of agonizing pain before succumbing to his injuries. $26,000,000 settlement for the family of a 35 year old woman who was a pedestrian struck and killed by a truck on 6th Ave. in Manhattan. This is believed to be the largest settlement in the history of New York for the wrongful death of one individual. $12,500,000 verdict in this wrongful death case for the wife of a parking garage employee who fell from and was killed by a man lift while at work. $12,400,000 settlement for the wrongful death of a 40 year old woman and mother who died in a gas explosion that took place in her house in Queens, New York. $9,000,000 settlement for the wrongful death of a man who died at a hospital as a result of negligent post-operative care following colon resection surgery. $6,500,000 settlement for the wrongful death of a man killed in an explosion as a result of a defective propane tank. $8,000,000 Settlement In Wrongful Death Drunk Driver Case in which a 23 year 0ld woman suffered injuries resulting in her death. She was survived by a 4 year child. $6,000,000 settlement in this wrongful death action for the family of a Westchester County man who was killed in an automobile accident when a drunk driver struck a stopped Police car resulting in an explosion and fire. $5,000,000 settlement in a wrongful death case in which a father was killed in an auto accident . $5,000,000 settlement in a this wrongful death case in which a bar permitted a man to continue to drink alcoholic beverages before he started driving. That man then drove while intoxicated, killing a father of two children. $5,000,000 recovery in New York County in a wrongful death case for the widow of a physician struck and killed by an N.Y.P.D. tow truck while he was riding his bike on the Green Way on the West Side when the truck made a right turn onto the path and crashed into him. The decedent was not wearing a helmet. $4,800,000 verdict for the wrongful death of an 8 year old child killed as the result of the negligence of a truck driver . $3,500,000 recovery in Suffolk County for the death of a DEA agent killed when the cesspool at his home collapsed. $3,025,000 verdict for the wrongful death of a woman in a New York Car/Bus Accident Affirmed By New York Appellate Division, Second Department. $2,975,000 settlement for the wrongful death of a New York construction worker who was killed when a 3000-pound concrete wall panel fell on him when the hoist securing the wall panel broke because it was insufficient to support the weight. $2,600,000 recovery for the death of a man struck by a car while sitting in a restaurant when the car crashed through the window. $2,200,000 settlement in a construction accident case on behalf for the death of a laborer in a construction accident. Our New York wrongful death attorneys obtained the Top wrongful death verdict listed in New York State in 2017. 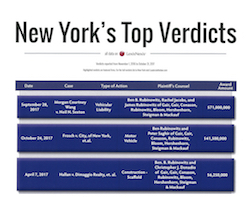 This verdict is also the third highest verdict of all listed 2017 NY Personal Injury Verdicts and the fifth highest verdict of all listed 2017 NY Verdicts for all categories of law. When I first came to this firm for help, I was still reeling from the loss of a loved one. Thankfully, from the moment I walked through the door, I was treated with nothing but compassion and professionalism. Everyone, from Carolann to Angie, to my attorney Marijo, displayed a kindness and understanding that assured me I was in great hands. Whenever I had a question or concern, they were never more than a phone call or email away, and even though I knew just how busy they were, I could always expect a thoughtful response within minutes. The diligence and hard work they put into my case were truly evidenced by an outcome that surpassed my expectations, but the personal touch they provided is something I will always be thankful for.